You will notice a couple of new features in my newsletters. I am adding topic names for the various segments of the newsletter. The newsletters are the most read posts of the entire blog, so I thought that might make it simpler for those who are interested in a particular topic. Also, I've decided to add a segment in each issue on Travel that will give links to various states or countries and places that you may want to consider visiting, especially if they're in your area of the country. Let me know if this is helpful to you? 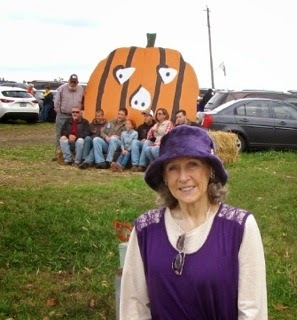 Travel - Blue Ridge Mountains - We made our annual trip to Drumheller's Apple Festival to get our bushel of local apples. Last year we tried another orchard further north just to do something different. What a huge disappointment. The apples were not good looking so we didn't get much diversity of varieties to bring home. There were only two that weren't all small with many blemishes. So ... we were really happy to be at Drumheller's again. The views of Nelson County are just awesome. Check out Crabtree Falls .... Oak Ridge Estate .... Swannanoa Palace .... Schuyler Soapstone Quarry (Schuyler is where the Walton family, of TV fame with John Boy, lived. Travel Alabama - Huntsville Botanical Garden has a Scarecrow Trail this time of year. 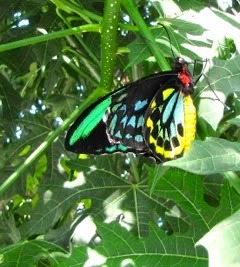 It also includes a butterfly house and bonsai plants. Travel - Botanical Garden/Butterflies - A few weeks ago we took a day trip to Richmond (67 miles) to visit Lewis Ginter Botanical Gardens. 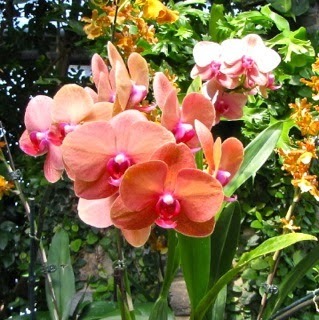 They also have a Butterfly Exhibit in one wing of the conservatory and an Orchid one in the other end. It was a beautiful day once the morning warmed up so we began our adventure at the Garden Cafe ordering a delicious Roasted Vegetable (red and yellow peppers and thin zucchini slices) Panini with a herbed cheese spread on a baguette that had fresh rosemary in it. They warmed it and it was absolutely delicious. Came with a pickle which is always a highlight for me. After our tummies were filled with contentment, we strolled about the grounds. Fountains, benches, lots of things in bloom for October, butterflies everywhere in the conservatory wing, and gorgeous orchids in the other wing of the conservatory. It's always nice to discover new plants at a botanical garden ... when they have the sign with the name in place. If anybody knows the name of the ones I couldn't identify, please email me or make a comment on the gallery site. Take a visit and a stroll through these gardens at my photo gallery: Lewis Ginter Botanical Gardens & Orchid House and/or Butterflies Alive Exhibit. Critters - Randal and I like to play a game at night. He has to spend a lot of screen time on the computer, so it's a great way to unscramble the brain patterns before getting a good night's sleep. It was warm enough one night to play on the screened porch and it was fun to use the motion-detector light to see the critters that visit our veggie and fruit scrap area. You could call it a compost area, but it's truly not. We toss it out there for any and all who want to partake and we get so many sweet visitors. It's amazing what our small bowl of scraps each day does for the benefit of wildlife. Carrot scrapings, banana peels (mostly enjoyed in winter when times are tough rather than in summer), apple cores, potato peelings, etc. We clean our plates and eat leftovers so we don't have any recipe type foods, but they are so grateful I just know it's a smile they're showing me as I watch them eat. When it doesn't get dark so early, we see more of them ... but it's been getting dark earlier and in a few days it will be even worse for our dinner time visitors since Daylight Savings Time ends on Saturday night. But they will still be there and I will still feel great about providing sustenance for them. 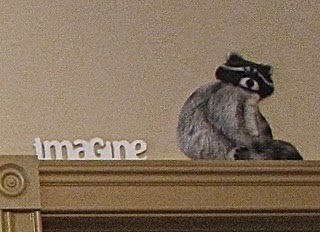 We have foxes, rabbits (not at the same time), raccoons, opossums, skunks, and deer. Black bears sometimes come through after their long winter's nap, but we're not too excited about that because they can break birdfeeders with a snap of the metal pole. Amazing how strong they are. For those who read the last issue of this newsletter, you'll remember the photos of the poor little squirrel that had been with us since 2007 and looked like she was eaten up with tumors or something else simply horrible. 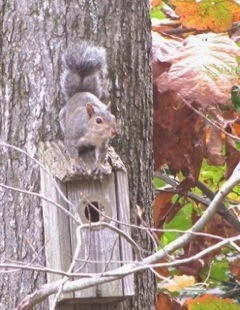 It had a hairdo type of tail which had set her apart from the rest of the squirrels. 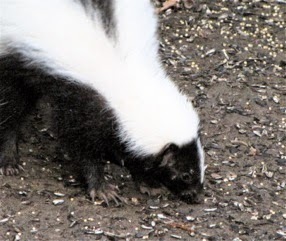 However, as I said then, I sent photos to the wildlife center near by hoping to get some good news and I did when they said it was a case of warbles, larvae of a bot fly that did plague squirrels, and that all would be well as they emerged and dropped to the ground. I've been looking for her ever since and today, six weeks later, I thought saw her run across the backyard and I ran outside to get photos. Needed to use my zoom and wasn't sure just by taking the photos, but when I loaded them into the computer, there she was with that funny little tail. Hallelujah! Thank you to those who sent up prayers for her. What a great ending to the story. Birds - It takes me a few days to put together this newsletter, and on the day I'm writing now, it's been a beautiful day of sunlight on Autumn-colored leaves. Our White-throated Sparrows have arrived from Canada where they nest. The Ruby-crowned Kinglets are bouncing all over the place. They are so difficult to get photos of. A flock of Common Grackles flew in. They are so noisy and boisterous that it just commands your attention to watch them fly overhead in large masses and then all of them landing in a tree continuing to talk up a storm. They fortunately found a tree with lots of acorns because they didn't mass raid the feeders which leaves no room for the smaller songbirds to feed at their daily buffet. I think they are gorgeous birds ... although I wouldn't want them around year-round for obvious reasons. They come through in Spring and Fall while migrating. When we lived in Alabama they loved the hickory tree we had outside the dining room window. 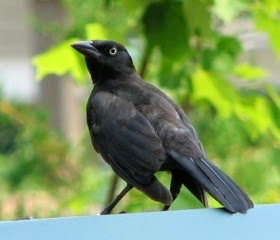 Years back one of the grackles hit our deck door. I believe it was being chased by a hawk. It dropped on the ground and I had the door open in seconds, hoping it was still alive and that I might be able to help it. I sent Randal to get something to protect me from their sharp claws and had him in my lap in moments giving him some Distress Remedy for the shock. It was a beautiful and serene moment in life to be so close to one of God's creatures that now depended on me to come to his aid. After he became a bit more normal I put him in a box so he could rest and decide when it was time to take off for the skies again. So much awe and wonder in nature! View the rescue photos here. Click the arrow below the pictures to see all photos. 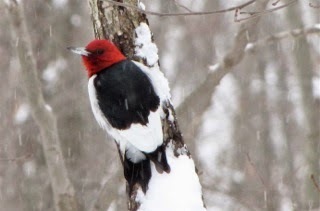 We've had a Red-headed Woodpecker digging a hole in one of our dying trees near the top which was broken off. Woodpeckers drill roosting holes in late Summer and Fall and nests in the Spring. 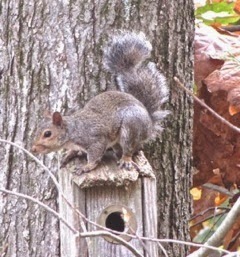 These times usually bother homeowners especially in the Spring when they are drumming to attract a mate. They don't usually do any damage in this since the hammering is not the same as when they are drilling a nest. But, sometimes they're drilling for insects that they hear behind the boards. That's a nice benefit on one hand, but you'll end up with holes before your "exterminator bird" leaves. For more information about why woodpeckers drill on houses, read Three Reasons Why Woodpeckers Drill Holes on Houses. We love our woodpeckers since they keep our trees more healthy by eating all those bugs. They're not songbirds but they are certainly beautiful. Instead of singing to attract a mate, woodpeckers display drumming behavior. They will drum on the sides of birdhouses, wood siding, gutters and downspouts. Drumming stops once the woodpecker has found his mate. 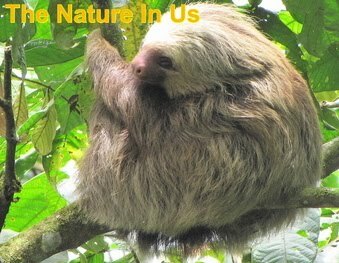 Pairs are formed in late Winter or early Spring, and breeding territories are established. Breeding begins in Spring. Excavation of a nest cavity takes 1-2 weeks. Our Red-headed has been at it for a week that I know of. He's now disappearing into the hole, so I imagine it's almost done. Just the curtains to hang. In Spring they will add no nesting material since the eggs are laid on the wood chips left there during excavation. Both parents incubate and feed the young. Ravens Roost - Blue Ridge Pkwy. Family & Food - Our son, Benjamin, has become interested in cooking. He had no interest at all when he was growing up, but then I wasn't diligent in the pursuit since the lack of interest from him matched my preference of having the kitchen to myself. Randal also had no interest since he grew up not cooking at all either. Actually he says he did cook because he made sandwiches. This seems to have all begun with a Google Hangouts lesson on making an omelet. Ben loves omelets and wished he knew how to make one. I said it's very simple and we could do it with the online video option on a phone call ... and so we did. He did an excellent job on the first one and has improved them to look like a work of art. Recently, Randal spent a couple of weeks in Oklahoma to get his parents moved into long-term care and get some family matters taken care of with his brother (which I might add went well, so thank you to those who prayed for the situation). Their dad is doing much better and has gone from being pretty despondent to being rather jovial. We are all glad to know of the improvement. 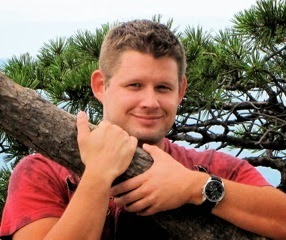 Ben lives in Oklahoma and while Randal stayed with him, he made things for their meals that might interest Ben to add a few more specialties to his chef board. One of them was of great interest ... quiche. Over a week ago, I received an email with a picture of a quiche he had made for lunches. He works only a few miles from home, so he can go home for lunch. 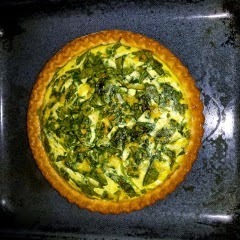 I was shocked to find out that the photo was actually the Spinach Quiche he made. I thought it was the one from the recipe website, but it was his alone. I expect we'll soon be seeing Chef Benjamin on the Cooking Channel. It looks like a work of art to me. Any interest in the recipe, here's the link. He used fresh spinach instead of frozen. Randal's 60th birthday was October 23rd and we made it a week long celebration of little events or special food items. He didn't have the grand idea of making it a year-long adventure like I did for my 60th birthday. 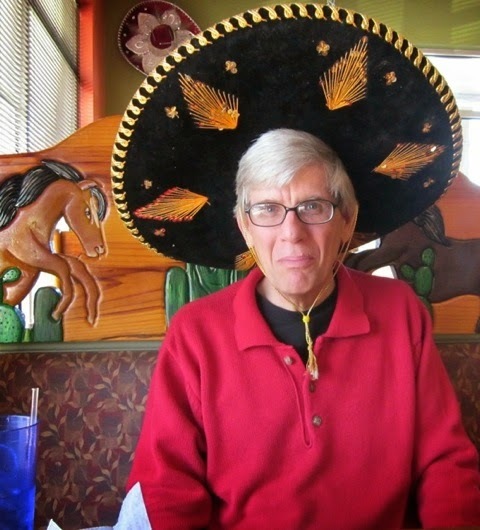 His actual birthday meal was at a Mexican restaurant which has been a long-held tradition. The servers at this local place decided he needed a hat when they saw me taking photos of the food and asked if I could photograph them so we could share the day with our son through pictures. I was laughing so hard it took Randal all he had to keep from losing composure for the photo. He was not cut out for a sombrero. The traditional Mexican meal choice? Three Cheese Enchiladas. Same order every time. Randal loves routine. Frugal DIY Gardening Projects - Need a few ideas for do-it-yourself projects for the garden? My resource for these ideas was an issue of Birds and Blooms magazine. The websites referenced on two of them have a wealth of other great ideas also. How about taking an old metal colander and turning it into a garden chandelier by adding marbles and lass hangings? There's no electric to it ... just beauty to behold. Check out the instructions here at the EmpressOfDirt.net blog. Instead of donating an old dining chair, add a coir-lined basket in place of the seat and plant your favorite flowers for an eye-catching delight in your garden or for your covered porch. Just made a move and have some of those wooden pallets? If not, you can generally find a place that would be happy for you to take them off their hands. What a great find for you to make a garden tool organizer by simply painting it and attaching hooks. Put it up on the side of a shed or in the garage to maximize floor storage space. Check out the instructions at OurLittleAcre.com. Spiritual - I've heard it said that unless you can imagine something on the inside of you, you can't see it on the outside of you. Imagination is a powerful word. 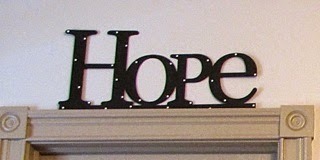 In the Bible the word 'HOPE' is used for positive imagination. When we have a problem or circumstance to overcome, we have to focus (meditate) on it and imagine seeing ourselves free of the disease or trouble. See yourself well and healthy and running or doing whatever it is that is your passion to be doing. Imagination is like a spiritual womb. You can't receive anything you haven't conceived in your heart. You've been given the ability to see things in your mind that aren't seen in the physical realm. Take the promises in the Word of God about your problem and meditate (chew and chew) on them until you can see these things happening in your mind. Imagination activates faith and faith brings into existence what you hope for. Hebrews 11:1 says, "Now faith is the substance of things hoped for, the evidence of things not seen." Empty yourself of small thinking. God has great plans for all of us and don't let anything or anybody take that knowledge away from you. You can do what you know you've been born to do. Don't know what you've been placed on earth for? God has a plan for everybody's life and nobody else can fulfill it. If you don't know what that plan is delight yourself in the Lord and His desires for your life will be placed in your heart (Ps. 37:4). Stay focused on your vision. We've watched a powerful series of TV broadcasts on "The Power of Hope." I would encourage you to spend some time renewing your mind with them. My favorite definition of hope is: "confident expectation of _________ becoming my reality." You fill in the blank with what you need. Healing, finances, relationships, etc. Imagine it being so until it is. Have patience. We don't change our minds overnight. If we've spent decades of unbelief that our lives will amount to much, we will need time to believe something else. If you're battling sickness and disease, don't give up. Excellent health is there for you and you will connect to it as you continue to focus on the Word and begin to realize that the Word is God's promise to you personally. Make the spirit realm more real than the physical. We were created as spirit beings and relate to God on a spiritual level (John 4:24). Study healing and renew your mind. "God Wants You Well" is a great article to begin with. On that link you'll see on the top right side links to free audio downloads or online TV broadcasts for an in-depth study of this topic.